This article is about the town Loei. For other uses, see Loei (disambiguation). Loei (Thai: เลย; pronounced [lɤ̄ːj]) is a town (thesaban mueang) in northeast Thailand. Loei covers the whole tambon of Mueang Loei District and is the capital of Loei Province. In 2005, Loei had a population of 22,677. 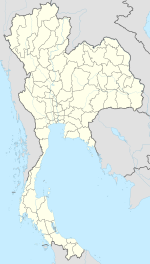 Loei lies 545 km north-northeast of Bangkok, 150 km west of Udon Thani. Loei lies in the fertile valley of the Loei River, which runs from south to north through the eastern part of the town. A range of hills lies to the east, including the Phu Bo Bit Park, about 3 kilometres (1.9 mi) from the town center. Loei has a tropical savanna climate (Köppen climate classification Aw). Winters are quite dry and very warm. Temperatures rise until April, which is hot with the average daily maximum at 35.9 °C (96.6 °F). The monsoon season runs from late April through October, with heavy rain and somewhat cooler temperatures during the day, although nights remain warm. ^ "Phu Bo Bit Forest Park". Thailand Department of National Parks, Wildlife and Plant Conservation. Retrieved 2 February 2013. ^ "Climatological Data for the Period 1981–2010". Thai Meteorological Department. p. 8–9. Retrieved 1 August 2016. ^ "ปริมาณการใช้น้ำของพืชอ้างอิงโดยวิธีของ Penman Monteith (Reference Crop Evapotranspiration by Penman Monteith)" (PDF) (in Thai). Office of Water Management and Hydrology, Royal Irrigation Department. p. 41. Retrieved 1 August 2016. This page was last edited on 9 February 2017, at 00:52 (UTC).